"Veronica of the Living Dead" might be too on-the-nose as an alternate title for iZombie, but that idea obviously coursed through the mind of show creator Rob Thomas while brainstorming his latest for The CW, developed as a loose conceptual adaptation of the comic series from Vertigo. The somewhat awkwardly-named series explores that universe's perception on the zombie infection and apocalypse as a vehicle for an unlikely detective -- a young, inexperienced woman whose interest in the work was catalyzed by a traumatic event that recalibrated her social status -- to exploit the unique abilities forced upon her by the affliction, filling gaps that the local police department couldn't otherwise. While Olivia's genesis as a supernatural case-solver is of a morbid nature that's overused to its advantage in the weekly murders giving her a purpose, creator Thomas and his team of writers synthesize those genres with a helping of dark humor to create a clever, unpretentiously expressive twist on the zombie setting, ushered into the "... but they're not all monsters!" subgenre with attitude and grace. Set in Seattle, iZombie takes little time in introducing us to Olivia Moore (Rose McIver), a medical resident who lives a relatively sheltered life in the vein of many other professionals in the field, typically opting to chill at home with her fiance, Major (Robert Buckley), instead of socializing with co-workers. It's a philosophy she should've stuck with, apparently: the one time she decides to accept an invitation to let loose at a boat party (without Major), she gets embroiled in an attack from a horde of zombies, one of which scratches her and spreads the infection. Thing is, she doesn't become one of those Romero-esque mindless zombies right off the bat, discovering that she's able to fend off the degeneration by consuming the brains of humans, preserving a degree of humanity herself despite changes in her appearance. Devastated, both by trauma and by her sudden hunger for human brains, Liv restructures her life by breaking her engagement and taking up a job at the local police morgue, where she discovers that the side-effects of her brain consumption -- she absorbs the memories and tics of their owners -- could help with detective work. iZombie takes a bold, commendable "Deal with it!" approach in getting things up to speed on Liv's life: the span of series' standard-length pilot manages to show how she became a zombie, jumps ahead several months, reveals how her boss, Ravi (Rahul Kohli), discovers and believes that she's a zombie, and ultimately gets her "abilities" integrated enough with homicide detective Clive Babineaux (Malcolm Goodwin) to solve her first case. That's a lot of ground to cover, and while Rob Thomas and his crew tackle the challenge with gusto, the first handful of episodes do suffer during that rush towards establishing the concrete foundation and formula of its weekly storytelling. Admirably, the show doubles down on its self-aware, witty personality without dwelling on any head-scratcher issues for very long, instead throwing Liv headlong into a rhythm of consuming brains, absorbing their mental traits, and assisting her connection in the homicide department -- sometimes out in the field -- under a somewhat dubious guise that hides how she really gets her intel. The grotesque eccentricity involving Liv's absorption of mental traits justifies the wobbly logic of iZombie, vitalized by humor from the brain-muncher's embodiment of fluctuating personalities and the suspense in seeing what information will be provided by her next batch of memories. This isn't really like Orphan Black where Tatiana Maslany fully realizes different characters with the same physical traits, instead filtering archetypal characteristics -- poeticism and passion; maternal instinct; bitter agoraphobia; literal psychosis -- through Liv's wounded and semi-snarky disposition, luring out doses of humor and fleeting existential ponderings from Rose McIver's shrewdly charming undead persona. Her Warm Bodies-esque "visions" are a tad more problematic, often feeling manufactured and responding conveniently to the demands of the individual cases. Triggered by visual cues and physical gestures repeated by Liv that juggle creativity with stretched believability, they reveal just enough of the puzzle to progress cases forward another step, revealing an engineered structure inside many of the individual cases. Things kick more into gear several episodes in after iZombie sinks its teeth into an overarching mystery and an evolution in its setting, involving disappearing homeless teenagers and a suspect, the "Candyman", whose motivations tie into an underground culture that reveals more zombies like Liv exist in Seattle. 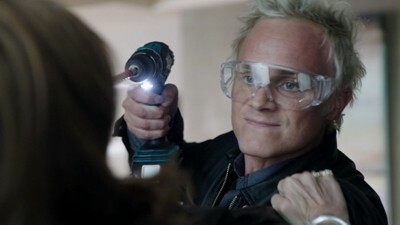 Despite a predictable villainous turn from David Anders as an illicit peddler of many varieties, whose unctuous scheming feels stale after seeing similar traits in Heroes and The Vampire Diaries, the show hits its stride once it revamps the setting into one plagued with zombies caught in limbo and fiending after their next fix. The writing discovers sneaky places and times to answer lingering questions alongside the deepening mystery, too, notably about the wonky rules of the condition itself -- namely how those like Liv figured out in time that they needed to eat brains -- and about the origin of the virus itself. And it enjoyably does so, knowing when to turn Liv's focus away from random investigations and towards a steady stream of information about the cause, and potential cure, of her affliction. Alongside the core mystery, iZombie also engages in the same kind of monster stereotype adjustment found in other certain contemporary vampire and werewolf stories, transforming pre-zombies into sympathetic, accursed figures who have an even harder time procuring their nourishment in nonviolent ways. Through the ongoing mystery of the "Candyman" and how it involves those closest to Liv, the writing taps into clear-cut, humble melodrama by exploring the bizarreness of zombie mood swings and the bleak alternative methods of getting and eating human brains, without trying to assign labored social metaphors to it all. 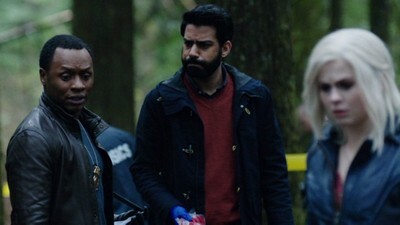 Ravi's accepting and jovial attitude towards our heroine's condition brings pitch-perfect levity to the situation, delivered just right by Rahul Kohli's British-accented charm in icky morgue scenes not unlike those found in Fringe. Ali Michalka assists in this by delightfully filling a sisterly role as Liv's concerned-yet-unaware lawyer roommate, while Merlin's Bradley James complicated Liv's life as a handsome and compassionate musician with an eye for her. Throughout the polished premiere season, iZombie successfully masquerades that it's a show on The CW with macabre, fairly dark content that blurs the line of what one might expect from the network, but its overly chaotic and transparent cliffhanger climax reminds one that, yeah, the show's right where it belongs. While the final couple of episodes bring a strong, gratifying sense of finality to the "Candyman" arc, the show also throws a lot of gratuitous, recognizable horror-drama in at the end, designed for knee-jerk responses and running certain therapeutic subplots into the ground, full of theatricality. 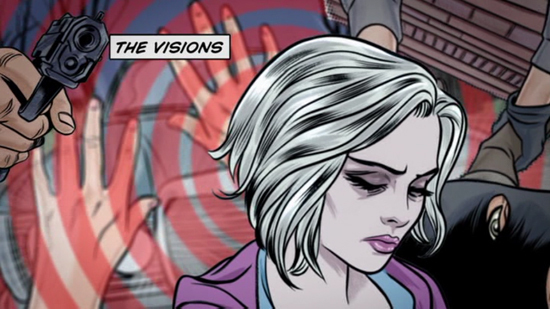 iZombie's grasp on the melancholy dramatic aspect of Liv's vexed existence keeps it alive, though, with the truth closing in around her and fewer escapes at her disposal, the expectation of what choices she'll make next about her condition offering enough curiosity to continue following her oddly clairvoyant adventures through the minds of other people. More bizarre than anything, the show makes one care about a monster who cannot live without consuming human brains ... and, in the absence of a cure, don't want her to stop doing so. iZombie: The Complete First Season emerges onto DVD from Warner Bros. Home Entertainment in a familiar, yet stylishly-designed package, taking some of the artistically-rendered design promo artwork for the show and modifying it for a standard keepcase-sized image. A moderately-solid, side-loading slipcover replicates the front and back artwork designs, while the inner artwork carries over into the Episode Guide included within. All three discs are solid red with the show's logos revealing the disc's standard shine underneath. Like other primetime horror shows on The CW, iZombie divides its visuals between clearer daytime scenes and a few brightly-lit interior shots or a lot of dimmer, heavier-contrast material, both indoors and out. WB's batch of 1.78:1-framed, 16x9 transfers handle the demands of the material rather well for there being five episodes on the first two discs (three on the third), offering strong shades of fleshy pink and lab-equipment blue in the morgue, assertive foliage greens in the numerous forest murder sites, and carefully-handled skin tones involving Liv's paleness in comparison to the bronzed tones of other zombies. Contrast varies between exceptionally respective black levels and controlled light sources to some rather serious crush and dimness, while mosquito noise becomes problematic in several darker sequences. Fine detail becomes the deciding factor here, which handles hair follicles, the sharp lines of firearms, and the contours of brain matter and blood spatter with surprising fine clarity at times for a standard-definition source, a few hazier scenes notwithstanding. In the absence of a high-definition presentation, iZombie stands upright. Aside from the whirr of power tools, the gurgling of a single zombie, and the rhythmic percussion of the series' theme song, there isn't a whole lot of interesting sonic activity going on in iZombie's arrangement of 5.1 Dolby Digital tracks. Most of it hinges on the audibility of dialogue within the lab and in the interrogation room, which is solidly audible but not really presenting anything noteworthy. Surround activity stays relegated to slight surround touches -- the only time I really took notice of the track's fidelity was when the voices within someone's head starting bouncing around between the channels -- and stuff like gunshots are loud and blunt without telegraphing a meaty punch. The music encroaches on clarity a few times (there's a conversation between Blaine and a woman where audibility suffers), but not frequently enough for it to be a cause for concern. Again, what stands out are the sounds of bonesaws, drills, blades, and other higher-end elements, which are satisfyingly piercing. English, French, Spanish, Portuguese, and Thai subtitles are available. 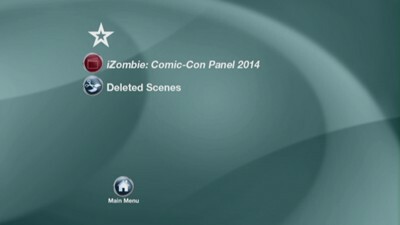 Aside from an arrangement of Deleted Scenes scattered across the three discs, iZombie also arrives with a iZombie Comic Con Panel (28:58, 16x9), a Q&A session with the cast and creators of the show at San Diego Comic Con. They touch on topics both big and small, from the differences in Vertigo's comics and the casting process for Rose McIver to simple questions like: "What happens when Liv eats a whole brain?" It's standard, energetic con fare that's worth a watch. Toss Veronica Mars and Medium together with a helping of human brains and some Sriracha sauce, and you've basically got The CW's latest horror/dram-com hybrid, iZombie. A blitzed, devil-may-care introduction to the universe and a raucous finale end up being endearing flaws that bookend a supremely entertaining stretch of supernatural case-solving, morbid humor, and genuine horror-laced relationship drama. The cases themselves may merely be tolerable at times, but they're typically great vehicles for Rose McIver to get consumed by a new personality type and for her character to pursue the real mysteries lying underneath it all: the root of what caused her zombie condition, the other zombies like her across Seattle, and the endeavors of the "Candyman" within that network. This not-so-guilty pleasure arrives from WB in a fine arrangement of audiovisual treatments, though light on special features. Strongly Recommended.